And is making Him who killed Madhu  supremely happy. And is the consort of Purushottama. And saluations to her who is the consort of Damodhara. And salutations to her who is the consort of the son of Nanda. To the queen of the heart of my Lord Murari. And who is the daughter of the ocean which gave nectar. One sage who did penance to have goddess Lakshmi as his daughter and succeeded. A mythical bird which is always thirsty. Another name for sage Bharghava referred earlier. He who was tied by a rope in the stomach –a name of Lord Krishna. Goddess Lakshmi was supposed to have come out of the ocean of milk during churning .Nectar along with many things also came out similarly. 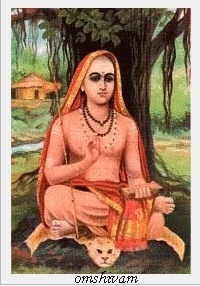 Bhagvan Shri Adi Sankara was one of the greatest saints of his time.He was born in a Brahmin family in Kerala. After brahmopadesa, as is usual during those times, Bramhmachari were asked to beg alms for his lunch. One day when little Adi Shankara went to a Brahmin house, the lady of the house was so poor that she did not have anything to give him. She searched hard and found one small fruit of gooseberry, which she gave to Sankara the boy. 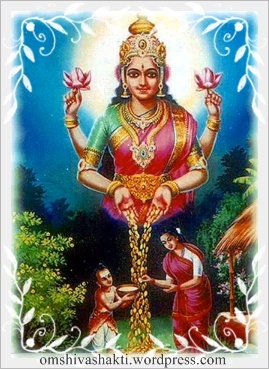 He was so touched by her gesture that he sang these 21 mellifluous hymns on Goddess Lakshmi, who poured golden goose berries as rain to the poor woman’s house. Anybody who sings this Stotra withfull heart poverty would be banished from his or her lifeforever & Goddess Lakshmi would shower Blessings on them who recite this stotra every day.